Bible.org's commentary on today's readings in Genesis titled "Grasping the Great Truth of God" is at this link, and "Marks of Maturity" is at this link. What a blessing to read the Lord's Prayer in today's readings! I have to confess, I don't say this prayer very often... and Jesus seems to indicate pretty clearly that this is a good way to pray. :) I do pray often throughout the day - but usually it's pretty immediate stuff - bless this meal, thank you for this day, bless my time at work, etc. etc. What a great thing it would be if I could remember to actually pray the Lord's Prayer a bit more... I do think it is good to pray things beyond the Lord's Prayer - in fact, just take a look at the Psalms for some ranges of prayer. You might infer from verse 7 that we should stick only to the Lord's Prayer when praying: "When you pray, don't babble on and on as people of other religions do. They think their prayers are answered only by repeating their words again and again." However - I read a commentary that this verse was admonishing against the polytheistic religions where people prayed to every single god's name they could think of, and would continue to repeat all of the gods names over and over, in hopes that this "babbling" would work to where one of the gods would respond to their pleading. So - I think God loves and enjoys hearing us pray to Him in whatever way we do so - but we should not neglect the fact that when Jesus gave us the Lord's Prayer He said (in verse 9): "Pray like this." Verse 24 has always always been a verse that's convicted me and still does today: "No one can serve two masters. For you will hate one and love the other, or be devoted to one and despise the other. You cannot serve both God and money." There is so much truth here in these 3 little sentences... Who are we serving in our lives today? I once read that one good indicator is to take a look at your monthly budget. Where does the money go each month? Interesting way to look at this. Maybe another way to look at this is how you spend your time each week. How much time is spent at work, volunteering, being with God, being with family/friends, taking a Sabbath, etc. 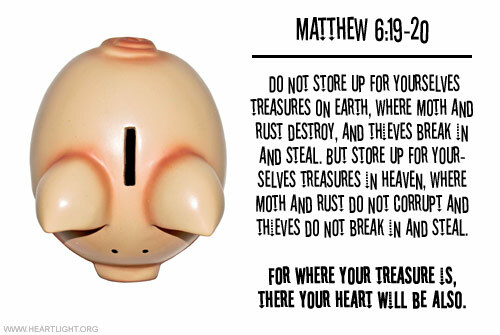 Maybe looking at how we spend our time and money is a good way to see who or what we are worshipping? Do you believe that it is true that we cannot serve two masters? Who are you serving these days? 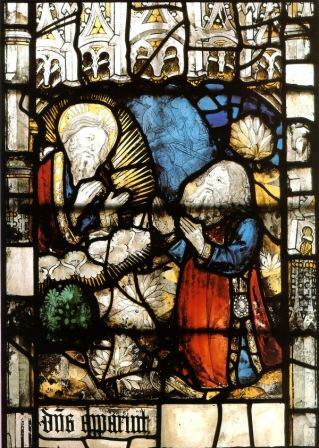 Bible.org's commentary on today's readings in Matthew titled "Jesus on Prayer" is at this link, and "Where Is Your Treasure?" is at this link. 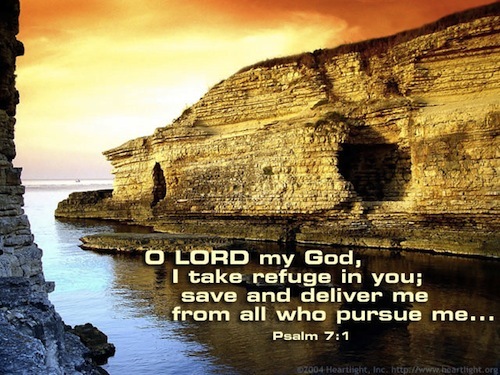 Psalms - Today in Psalm 7 verse 10 we read: "God is my shield, saving those whose hearts are true and right." What stood out to me here is that it does not say that God saves those who "do" what is true and right. It says that God saves those whose "hearts are" true and right. As discussed in yesterday's Matthew 5 post, below, this is getting toward our interior motives and thoughts and hearts - the important thing is not what we do on the "exterior", but who we are on the "interior". And then certainly if our hearts are true and right, a natural outflow of this is doing good things on the exterior. But, it's the interior - our hearts - that matter most. How is your heart these days? Is it true and right? And do you believe that God is indeed your shield? Proverbs - Proverbs 2 verse 2 today is a fantastic teaching: "Tune your ears to wisdom, and concentrate on understanding." There is so much noise and static and distractions in our modern world today that I think it is often hard for us to "tune our ears to wisdom & understanding." With our 24 X 7 society, we can go 100mph and just kind of feel like we're doing fine... but are we really doing fine when we are going that fast and moving all the time? Can you find ways in your life to slow down and "tune in" to God? I think reading the Bible each day is one amazingly great way to do this! What are some areas of your life that you can "tune out" this year in this new year so that you can spend more time "tuning in" to God and His wisdom? 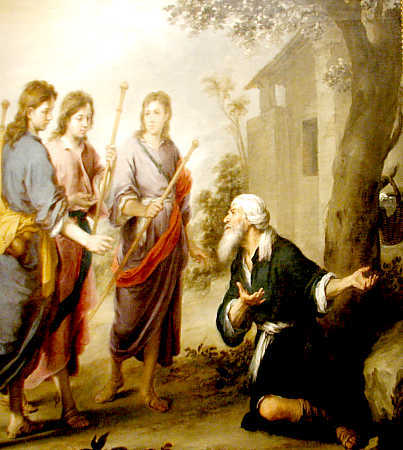 Worship God: Today's readings in Genesis 18 with Abraham showing hospitality to angels reminded me of course of The Newsboys song "Entertaining Angels:"
Think you've ever entertained angels? Click here and meet One greater than the angels! Prayer Point: Pray about which "master" you spend more time thinking about each day - God or money? Pray that you will only serve God. Comments from You and Questions of the Day: Based on our Matthew 6 readings today about the Lord's Prayer, let me ask you this: How do you pray? Or, in how many different ways do you pray? Do you pray specific prayers regularly, like the Lord's Prayer? Do you keep a list of people by your bedside to pray for regularly? Do you pray by writing in a journal? I actually had one friend share with me that each day of the week he would pray for a specific segment of his life and our world. For example, on Sundays he'd pray for his church and pastors and the worldwide church. On Mondays he'd pray for his family and coworkers and friends. On Tuesdays he'd pray for politicians and world leaders. And so on... And he'd repeat this pattern each week. This way he was very intentional about praying - otherwise he said he'd just end up lobbing up a few prayers each day - and usually just for himself. I think this is an interesting approach! Please post up some thoughts on your prayer life? Also, what verses or insights stand out to you in today's readings? Please post up by clicking on the "Comments" link below! Under three things the earth is disquieted, and under four it cannot bear up: Under a servant when he reigns, a [empty-headed] fool when he is filled with food, An unloved and repugnant woman when she is married, and a maidservant when she supplants her mistress. Leaving behind all the opinions about Sari finding a surrogate, Hagar, to carry her husband’s seed, according to the writer of Proverbs, Hagar, Sari’s “maidservant,” may have either tacitly or directly challenged her mistress’ authority. If the writer of the above three verses is correct in his assessment, than Hagar may have been making the ground shake, so to speak. She had produced for Abram what Sari couldn’t. She had been intimate with another woman’s husband, even if that woman initiated and facilitated the act. Talk about one-upmanship. We are a funny folk. We counsel people and when they received and act on that counsel and it goes awry, we distance ourselves from the consequences. Sari presented her handmaiden to her husband in an attempt to “work” God’s promise to her husband, or had Abram kept the promise to himself? Hmmm. (If Sari knew that God has given a promise of a child to Him, why whould she have laughed when the angel spoke to her husband? Or could she have thought the Promise was to her husband and not to her? That’s a whole ‘nother essay.) Either way, she turned on the one she gave counsel too, her husband. Abram heard the counsel but didn’t have to receive it. How many times do we accept someone’s counsel without considering what is being said just to make the person happy. When it blows up in our faces, if we go back to the person who was so generous with their ideas, what usually is the reception we received? Every one of us is responsible for your own choices no matter how strong the pressure to accept that advice. Bottom line is this: Not only will we have to serve our choices, but those we are responsible for, those under our leadership at home, work or church, will feel the effects. 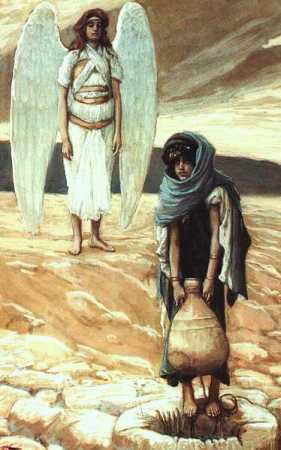 Abram’s relationship with Hagar was of the flesh. That which is born of the flesh is flesh. It is only the things born of the Spirit that will last. 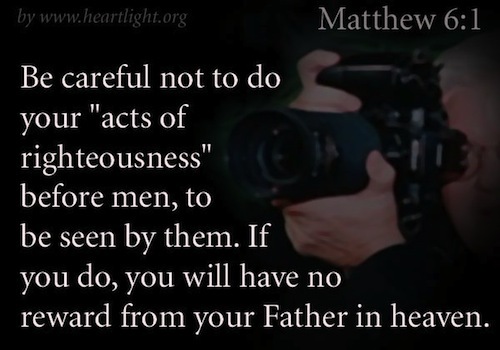 My prayer for all those who come to his Blog, myself included, is this: That we consider the consequences of our choices. May all here evaluate their decisions, are they of the flesh or of the spirit. All things of the “flesh” lead to death. Let us go on to live in Life. Let us stop producing Ishmaels in our lives. True, true, true! Ramona..let us stop creating Ishmael's in our life! To answer the question of the day..I pray in various ways..in the car, after hearing someone's sick or hospitalized on F.B. through my prayer journal! Especially my prayer journal..and at food time. Always have good food for thought when in my quiet time. And yes Mike, I love the mornings!! !